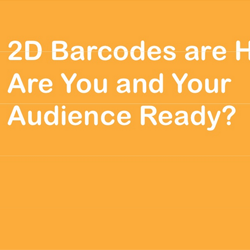 Webinar Slides: 2D Barcodes are Here. Are You and Your Audience Ready? Whether you refer to them as 2D barcodes, dot matrix codes or simply QR codes, the one thing that everyone can agree on is the fact that the use of 2D barcodes is on the rise. Whether they’ll be a passing technology fad or become ubiquitous as they are in Japan and other parts of the world, has yet … [Read more...] about Webinar Slides: 2D Barcodes are Here. Are You and Your Audience Ready?